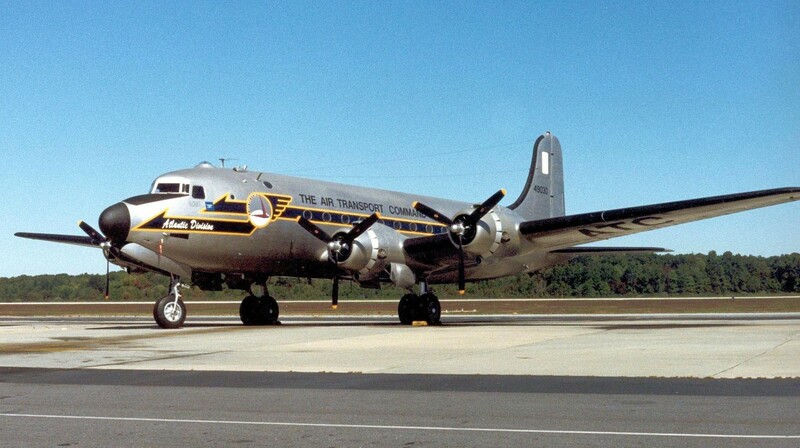 Dover AFB’s first strategic airlifter is represented by the single remaining C-54M which was specially modified during the Berlin Airlift for hauling coal. The Skymaster’s restoration was also quite extensive and took several years. 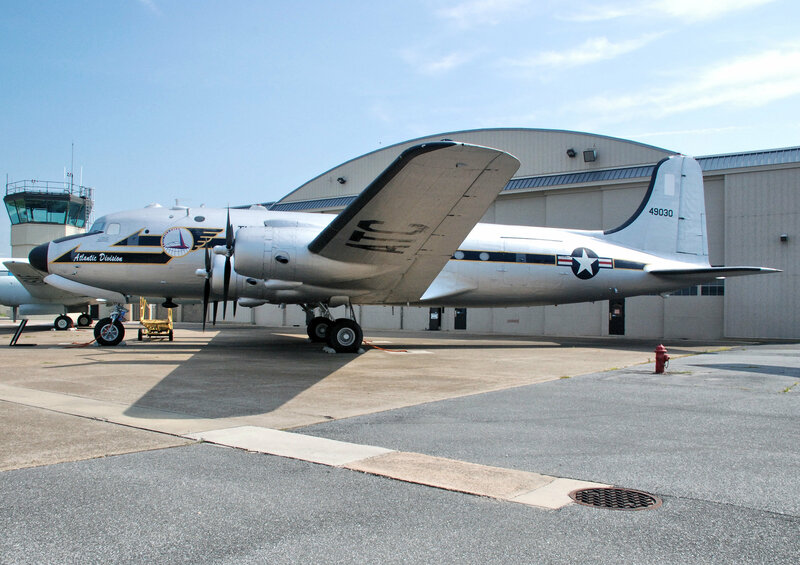 The inside shows examples of its World War II cargo and passenger configurations—and if parts become available will display how medical litters were carried in its Korean War role as a medevac aircraft. During the restoration process, we were fortunate to find a photograph of this aircraft showing its military serial #44-9030 and the markings it carried in the Pacific Theater in World War II. 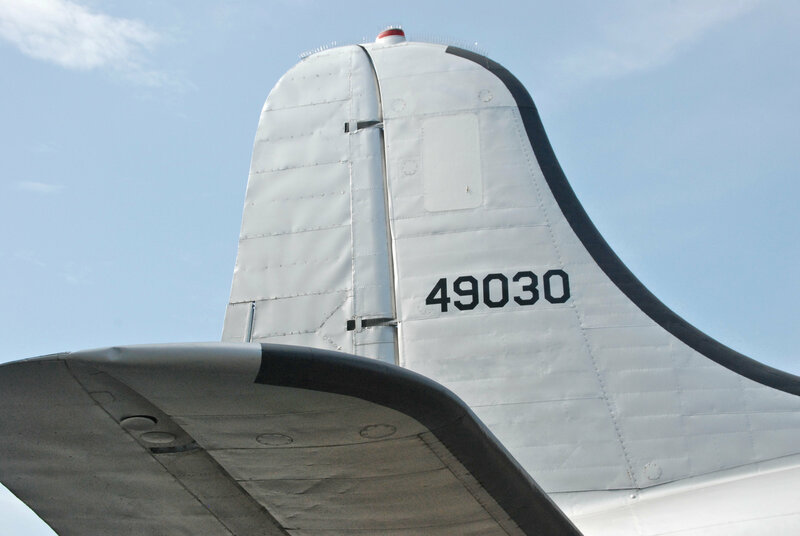 They were still in place during her service in the Berlin Airlift, and we have restored the aircraft in these markings. 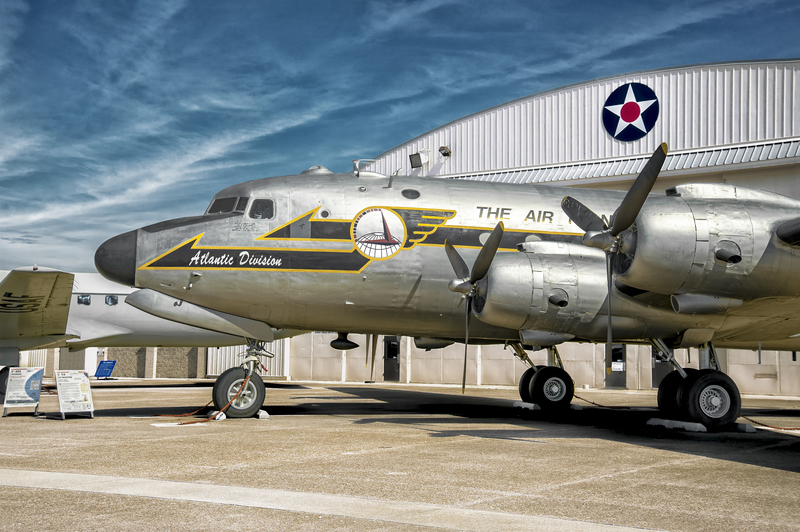 The C-54 on display at the museum is the last surviving “M” model in existence. There were only 38 of this model converted. Although it served with the U.S. Army Air Force (USAAF) as a transport, the C-54 made history when it became the first “official” presidential transport aircraft (Air Force One). Known as “Sacred Cow,” it was built in 1944 for use by President Franklin D. Roosevelt. One special feature was an elevator behind the passenger cabin to lift the President in his wheelchair in and out of the plane. The passenger compartment included a conference room with a large desk and bullet-proof picture window. President Roosevelt made his first and only flight in this aircraft traveling to Yalta, USSR, in February 1945. For security reasons, the tail number on the aircraft was changed for this flight. After Roosevelt’s death in April 1945, “Sacred Cow” remained in presidential service during the first 27 months of the Truman Administration. On 26 July 1947, President Truman signed the National Security Act of 1947 while on board “Sacred Cow.” This act established the Air Force as an independent service, making “Sacred Cow” the birthplace of the U.S. Air Force. It was later assigned to other transport duties and was eventually retired in October 1961. 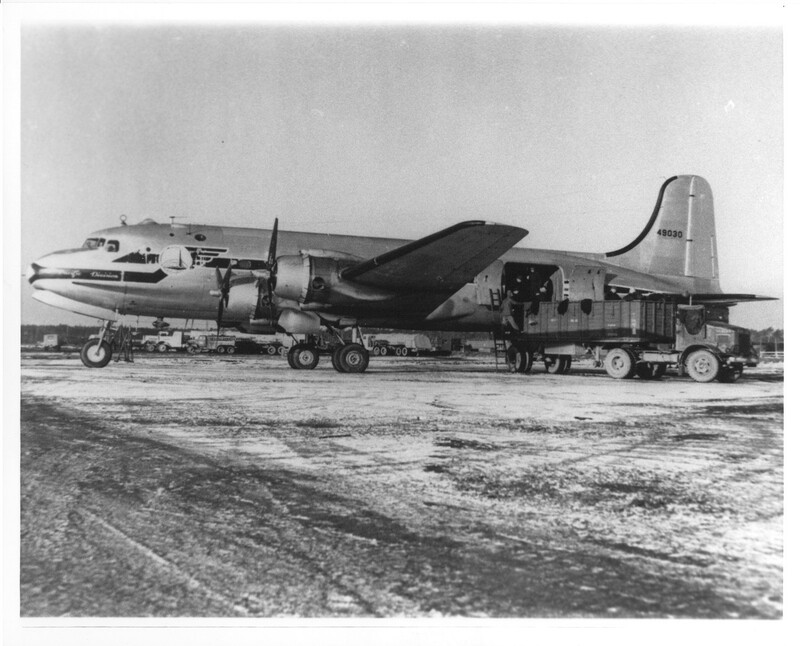 During the Berlin Airlift in 1948, every C-54 the USAF had was pressed into service to supply the isolated city. Many C-54s were later converted into litter-carrying planes for use during the Korean Conflict returning 66,000 patients to the United States. 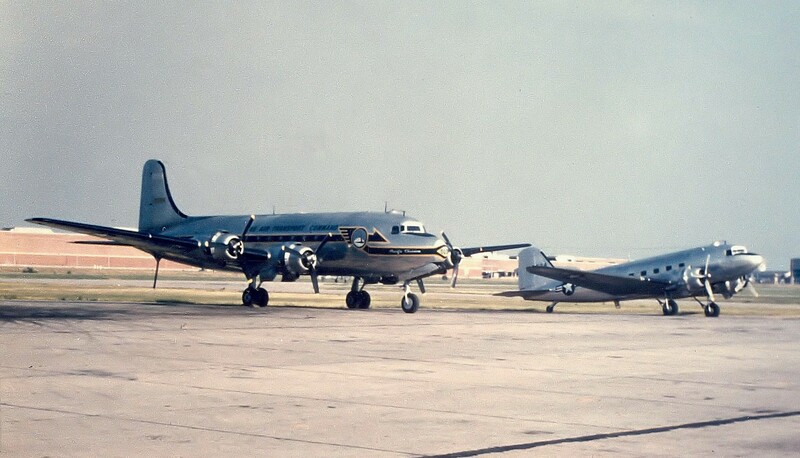 In later years, Douglas developed the XC-112, a pressurized version of C-54E Skymaster military transport. It had a longer fuselage, larger rectangular windows in place of circular portholes, and four 2,100-hp Pratt and Whitney R-2800-34 radial engines. 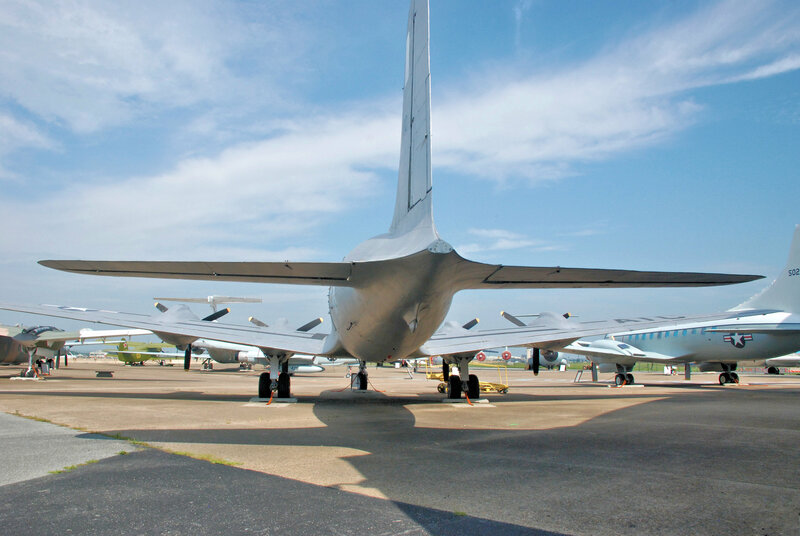 After testing, this aircraft entered commercial service as the DC-6 and military service as the C-118 Liftmaster. When I was in the Naval Air Reserve at NAS Dallas Tex I was a Plane Capt, then upgraded to FE. Then in 67-68 we converted to C-118s. You had to work on the plane then get in and fly. They Mothballed the C-118 while I flew as a FE in 1974 so I moved over to the AF and became a C-5 Flt Engr, retiring in 1994 at Dover AFB, DE. I’m a former USNR AC-1 (air traffic controller 1st class). I flew in the Navy’s R-5D version of this aircraft a few times in the 1960’s out of NAS South Weymouth, Mass., a USNR base which at one time housed blimps, or derigibles as the Navy called them. One of the VR (transport) squadron’s commanding officers was a well-known Boston TV personality who delivered the news on WBZ Channel 4. His name was Jack Chase. He was the only commander I ever saw who responded to enlisted men with a friendly “hello” when they called him by his first name while walking through a hallway. 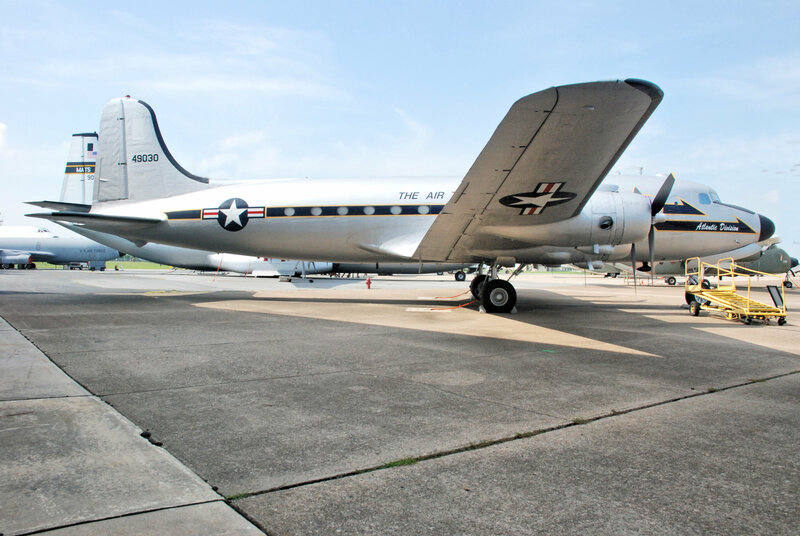 I flew on the C-54 out of Tokyo and the 99th ATS MATS in the mid 50’s. I was a radio operator, and loved that aircraft. Had 1500 hrs and then went to McGuire AFB on C-118’s. Also a great aircraft. From 1960 to 1962 I was stationed at Wheelus Air Base Tripoli, Libya. 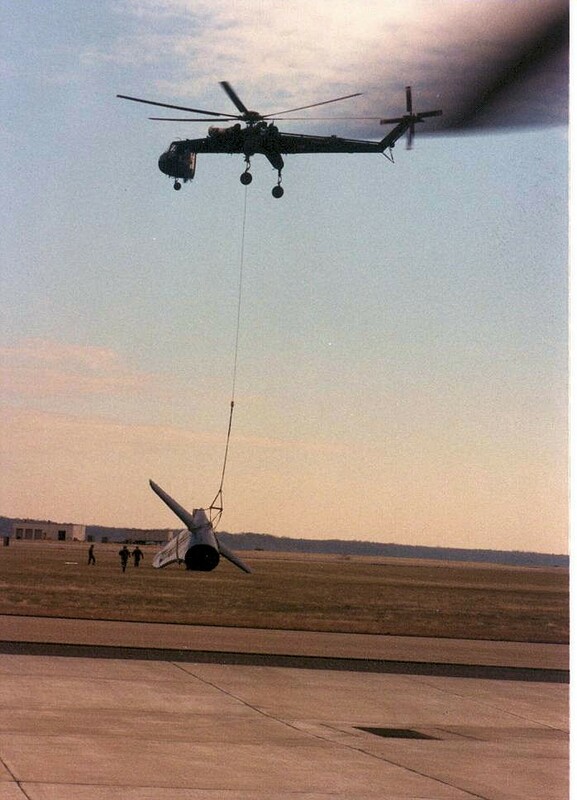 My Squadron was the 58th Air Rescue Sqdrn., our planes were SC-54s and SA-16s. We had one Model C 54 and its tail number was 033, my job then was a flight engineer. One Thanksgiving we flew 033 to Germany to pick up fresh veggies for the mess hall, we had a purchasing agent with us. On our return we were at the end of the taxiway doing our engine run-ups when this purchasing agent asked what would happen if we lost an engine on take off. I motioned with my hand doing a nose dive, he return to the cabin wrapped himself in a blanket and stayed there for the eight hour flight. In February 1960 I flew on a C-54 from McGuire AFB, NJ, to Gander, Newfoundland, Canada, to Prestwick AB, Scotland, and on to Rhein Main AB, Germany. Later, on 6 March 1961, going to my father’s funeral, I flew on a C-54 from Rhein Main AB, to Goose Bay, Labrador, Canada, to NAS Norfolk, VA. Returning to Camp Darby, Italy in April 1961, I flew another C-54 from McGuire AFB, NJ, to the Azores, and on to Rhein Main AB, Germany. The flight to Germany in 1960 was notble because I was in the first seat on the port side, sitting backwards, beside a seam in the fuselage which filled with frost, adjacent to the number Two Engine’s propeller. The landing in the Azores was notable because the high cross winds required almost a 45 degree crosswind landing and caused the pilot (I am a FAA certified Private SEL Pilot) to have to do a crab-low wing approach to touchdown. I could see almost the entire approach, and runway lights, all the way down, from my wing seat on the starboard side of the aircraft. Worked on this particular aircraft when it was assigned to Ankara air station Turkey, was one of 2 that were stationed there 9030 and 9039. Was glad to see that it survived all these years and was preserved. In September, 1955 I was transported from a holding hospital near Rhine Main AFB and boarded onto a M.A.T.S. C-54 for transport to McGuire AFB via the Azores Islands, where we stopped to refuel prior to the trans Atlantic flight. I was liter bound as were all the patients on that plane. As I recall, the first upper most liter was hung from the overhead, the second liter hung from the first and the third from the second and then anchored to the deck. The entire aircraft was filled with liter bound G.I’s bound for the States. We landed at McGuire A.F.B. and were off loaded to the base hospital at Ft. Dix. From there, two days later, liter bound, I was air lifted to Washington, D.C aboard a DC-3, to a grass strip near Walter Reed Army Medical Center. I was discharged from the Army at Walter Reed in January, 1956.